This project’s aim is to probe cell-mechanics in a living cell using a single gold nanorod held with optical tweezers. The first challenge of live cell probing is the restriction on the size of the probe, which should allow the cell to function normally. In addition, the probe should be smaller than the sub-µm sized structures that are to be probed. 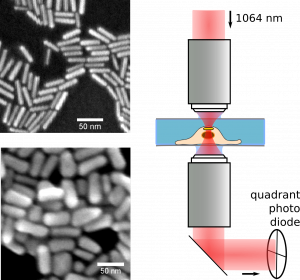 Because of their strong polarizability, gold nanorods of only 8nm x 40nm can be optically trapped. Gold nanorods have the invaluable advantage that their spectral properties are sensitive to the refractive index around the particle. This provides us with a mechanism to correlate local mechanical properties with the underlying structure. Because of the small dimensions of the probes, optical tweezers with metal nanoparticles can access a scale that is highly relevant to cells, but probably out of reach for other techniques.